Meeran Borwankar was a Humphrey Fellow at the Humphrey Institute of Public Affairs from 2001 to 2002. When she came to the University she was a member of the Indian Police Service. During her time at the Humphrey Institute she developed professional affiliations with local police departments and studied community policing. 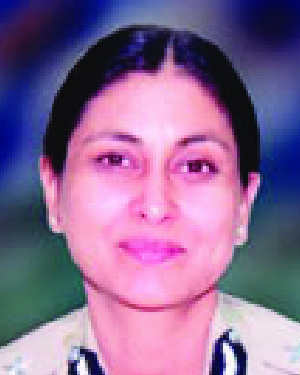 From 2004 to 2007, she served as the joint commissioner of police in the city of Mumbai and was entrusted with the crucial Crime Branch portfolio. As the head of crime prevention, investigation, and detection, she was responsible for mounting several operations against organized crime syndicates and terrorists. Ms. Borwankar has had a highly successful career and has achieved fame and recognition by her peers in the service. Early in her career she was awarded the President of India Police Medal for Distinguished Service, the highest award a police officer can receive in India. Ms. Borwankar works in a predominantly male-dominated field and young women in Maharashtra, and elsewhere in the country, look to her as a role model. She is currently the inspector general of police in the Crime Investigation Department. In this position she is the primary officer in the State of Maharashtra for initiating and monitoring action against the trafficking of women and children. She has been actively involved in issues that relate to the rights of women and children. Ms. Borwankar is working toward the completion of her doctorate on the topic of Community Policing, which is a direct result of her time at the University. In naming Ms. Borwankar as a recipient of the Distinguished Leadership Award for Internationals, the committee cited her implementation of community policing in the Indian Police Service, an innovation she learned while in residence at the University. She is a role model for young women, traveling incessantly to motivate and encourage them. She has pioneered and played a leadership role in adopting strategies to control organized crime and her long-standing concern with larger social issues such as the rights of marginalized groups.